There’s nothing as equally exciting and scary as bringing home a new baby. You probably freaked out a little when you brought your baby home for the first time, and that’s ok! You have a tiny human that depends on you for everything, which is amazing yet worrisome. As a parent, you want your baby to be safe at all times. That’s why you’re Googling car seat safety, right? We’ve got the low down on everything you want to know about car seats and what features you’ll want in yours. It’s important to read the car seat’s label for specific weight and height limits. Depending on the size and age of your child you may need a larger or smaller seat. This is the first seat you will purchase for your baby. These are made for infants only and are meant to face the back of your vehicle for safety reasons. They often come with handles so they can be used as carriers as well. Typically these infant seats have a weight limit of 20-30 pounds and also have height limitations. Convertible car seats can face the front or back of the vehicle. However, if your child is under the age of 1 the seat must face the back (the recommended age is 2). They can be used for infants starting at 5 pounds and can also become forward facing seats for older children. The harness fits children up to 40 pounds and sometimes more if the ears are not above the top edge of the seat. For children who outgrow safety seats with a harness. Most children need a booster from about age 4 until at least age 8-12 for proper fit of belt. There are two types of booster seats; a high-back booster and a low-back booster. A high-back booster seat uses the vehicle’s lap/shoulder belt and provides head and neck support for the child if the car does not have a built-in head restraint. A low-back booster seat is for use in vehicles that have a built-in head restraint. This type of booster seat is also used with the lap/shoulder belt to properly secure the child. When children outgrow their booster seats, they can use the adult safety belt in the back seat if it fits properly; lap belt fits low and snugly over the hips/upper thighs and the shoulder belt fits across the chest and shoulder. Avoid dressing your child in bulky clothing or wrapping them in blankets when you buckle them in. This can prevent a snug fit. Consider buckling your child in first and then placing a blanket or coat over the harness. If there is extra space, fill it with rolled blankets on each side on your child’s head and shoulders. If there’s a gap between the buckle and your child’s groin (common for young infants), try placing a rolled washcloth or diaper in the space for a more secure fit. There are two ways to install safety seats in a vehicle; with either the vehicle’s safety belts or the LATCH (Lower Anchors and Tether for Children) system. The LATCH system has metal anchors in the vehicle (where the seat cushion meets the seat back) and top tether anchors. The LATCH system, required on all car seats and most vehicles manufactured in the U.S. after Sept. 1, 2002, was developed to make it easier to correctly install car seats without seat belts. The car seats have lower attachments which fasten into anchors in the backseat of the vehicle where the cushions meet. An upper strap or tether on the car seat attaches to an upper attachment point in the vehicle. If a car seat is not installed correctly, your child’s safety could be in danger. Every car seat has different installation instructions. Here are key items to keep in mind when installing a car seat. Read the car seat instruction manual and the portion of your vehicle’s owner’s manual on car seat installation. Every car seat needs to be installed using either the lower anchors of the LATCH system or the seat belt to secure it in place. If you choose to use a seat belt to install your car seat, pay close attention to how to lock your seat belt in the vehicle owner’s manual. If it is a rear-facing seat, make sure the car seat is installed at the correct recline angle. Most car seats have built-in angle indicators or adjusters that help with this step. Here’s a video that shows how to install an infant only car seat. Once your car seat is installed, give it a good shake at the base. Can you move it more than an inch side to side or front to back? A properly installed seat will not move more than an inch. 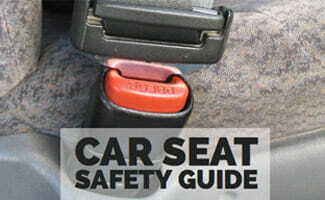 Make sure the harness is tightly buckled and coming from the correct slots (check car seat manual). Now, with the chest clip placed at armpit level, pinch the strap at your child’s shoulder. If you are unable to pinch any excess webbing, you’re good to go. Safety seats and booster seats must be properly installed. Find a certified car-seat technician via the National Highway Transportation Safety Administration or get them checked at your local police department. Use toddler car seats properly, so educate yourself about where the straps should be (the lap belt needs to fit snuggly across the upper thighs, and the shoulder belt should go across the middle of the chest). Make sure they’re tight enough (you should be able to fit two fingers but no more than that between the straps and your child’s body). One out of five parents believe it’s okay to take a short trip with their child unbuckled. Additionally, more than more than 60% of vehicle accidents involving children happen within 10 minutes of home. Those are some scary statistics. That’s why it’s important to spread the world and keep children safe. Do you feel like your child’s car seat is safe? The information contained in this article and website is not intended nor implied to be a substitute for professional safety advice, it is provided for educational purposes only.